The FocusMaker DSLR Focusing Tool is a follow focus system that allows you to get fast, smooth, and accurate focusing on virtually any DSLR lens. The FocusMaker mounts on your lens and is comprised of a ruler with incremental focus marks, lens strap, sight, clip-on stops, and handles. It is lightweight at only 2.8 ounces and fits in most camera bags, making it ideal for small crews or single shooter setups. The FocusMaker features a half-circle ruler that straps on to the focus ring of your DSLR lens. The ruler offers incremental markings for increased accuracy when obtaining focus marks. A sight mounts on the lens barrel and provides a fixed point for viewing the ruler's measurements. Focus points are marked using the clip-on stops. The stops can be mounted to serve as active hard stops or as passive stops for loose or intermediate focus points. Two handles are provided which attach to the ruler and provide smooth, jitter-free focusing. A travel pouch comes included. Box Dimensions (LxWxH) 11.75 x 9.15 x 0.85"
DSLR Focusing Tool is rated 4.1 out of 5 by 18. Rated 4 out of 5 by John from Works as advertised BUT not so on 50mm Let's keep this short. If you are looking for a pro quality Follow Focus... This isn't it. BUT I didn't expect or need that. I needed something to allow smooth focus pulls for static use in a studio setting. My primary concern was not spending $300-$500 to accomplish this. This product does what I need for the right price. End of story. The only major drawback is that I use the good ole 50mm lens for a majority of my shots. Boy, do I love that lens. I quickly found that the tiny manual focus ring makes getting this product on and to stay in place tricky at best. On my larger lenses, no issue. I got it to work but one wrong bump and it pops right off. Rated 3 out of 5 by Gary from Does not fit my lenses well. Mounting the FocusMaker sight and ruler ion my Canon 70-200mm IS 2.8 works well. The sight does not fit my 100-400mm IS L II lens . the sense mount interfere. The sight is somewhat unstable when mounted on the Canon 24-70mm 2.8 IS L lens because of the AF button being in the way. Because of this I returning the FocusMaker. Rated 5 out of 5 by henryhbk from Very clever and simple So tis follow focus like tool is much simpler than other follow focuses. I had originally wanted to get a traditional follow focus for my DSLR, but that required rails, and a whole lot of bulk that is impractical in my shooting style in the OR where space is at a premium. This is much more compact (and way more cost effective). I also like that you can preset multiple focus points to do some very clever multi focus shots. Rated 4 out of 5 by Awakened Heart Productions from love this. I find this so much simpler and easier than a rod mount follow focus. Muscle memory and a glance at the grid allows intuitive natural follow focus. Even if I had an AC, I'd rather he used this. there's another brand of these out there I'd like to check out, but these are pretty good. Only problem is its made for lens with a larger diameter than my Zeiss's and squeezing it down to fit broke the first set after a year or so. Rated 5 out of 5 by Robert from works remarkably well Looks goofy, but it provides a smooth accurate focusing mechanism. It attaches easily to a lens that has a wide enough focus ring. Included are different colored stops which are handy for various focal points. I use mine at night when normal focusing is all but impossable. By perfocusing with the FocusMaker I can get good night shots. Rated 2 out of 5 by Jerry from Mickey Mouse Yeah, it works okay. But, mine broke in the first use. I glued it but it didn't hold. Now, I use it only when I really must. But, here's the thing: it's made so cheaply that it boggles my mind how they can charge $90 for it. Honestly, if I could've held it in my hand first, I'd NEVER have laid out that much for a plastic toy like this. Being as fair as I can, I think it's worth about $20. Rated 2 out of 5 by Jerry from overpriced Cheaply made and a strange 'rubber band' mechanism to get it on your lens. Mine came broken (glued it, rather than return it). The concept is perfectly fine but it's WAY over-priced and I feel pretty stupid for buying it. Rated 5 out of 5 by John Spinhirne from Good tool. Works great This is a simple but effective tool. A little over priced but it really works. Will this work for mirrorless lenses? Will it fit the smaller diameter? Looking to use on Sony A7s II with 35mm, 50mm and/or 85mm native lenses. The device utilizes a rubber strap with multiple holes in it to adjust the size to fit - I don't know how much smaller, if any, the mirrorless lenses are than those for DSLR's, but it definitely fits all my lenses and in particular my 200mm/f4 micro Nikkor manual focus, which I bought it for, is quite a 'slim' lens in terms of lens barrel diameter. I found this device most useful for doing focus stacking work where a number of shots have to be taken with very small changes in focus distance between frames. It looks like this is a 70-200mm zoom lens. I use this lens on a 5D Mk4 to shoot video and discovered that I can zoom, but it takes several attempts to get it right. 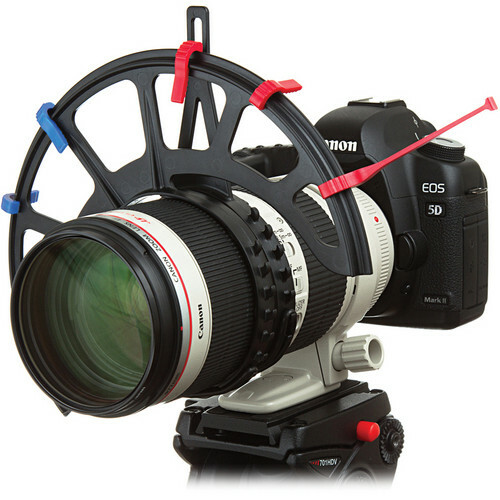 Looking at this accessory I think it may help smooth the zoom, what do you think? I suspect it may work for both focusing and zooming. It works well enough if you have some time to set it up before the shoot. I have had a couple of very dark set ups that I couldn't use traditional methods, tape, paint etc. to change focus and focal length and the Focus Maker worked great. Not something you will be using in a run and gun environment.